There’s an international awakening afoot about a radical expansion of corporate power—one that sits at the center of two historic global trade deals nearing completion. One focuses the United States toward Europe—that’s the Transatlantic Trade and Investment Partnership (TTIP)—and the other toward Asia, in the Trans-Pacific Partnership (TPP). Both would establish broad new rights for foreign corporations to sue governments for vast sums whenever nations change their public policies in ways that could potentially impact corporate profits. It’s a stupendously powerful tool and a double win for the corporations: It’s a money machine that loots public treasuries and a potent tool to stifle unwelcome regulations, all wrapped in one. As Senator Elizabeth Warren recently wrote in the Washington Post, “Giving foreign corporations special rights to challenge our laws outside of our legal system would be a bad deal.” But it’s a deal US lawmakers are rapidly preparing to make as they debate extending “fast-track” trade promotion authority to President Barack Obama. The system of closed-door trade tribunals has been around for decades now, nestled like a ticking time bomb into hundreds of smaller bilateral trade agreements between nations. But not so long ago, the trade tribunal system wasn’t the stuff of high-profile op-eds by US senators. It was virtually unknown except among a small cadre of international lawyers and trade specialists. A year later, however, Bechtel struck back—this time in a World Bank trade court. The company demanded not only the $1 million it had invested in the country, but a full $50 million—the rest being the future “profits” the company claimed it had forgone by leaving. Here in Bolivia, a soccer team from anywhere else would be foolish to play a match against a Bolivian team in La Paz, the nation’s capital. At nearly 13,000 feet above he sea level, most foreigners find it a serious challenge just to climb a staircase, much less chase a ball for 90 minutes. The legal venue chosen by Bechtel—the World Bank’s International Center for the Settlement of Investment Disputes (ICSID)—has a similar quality. It’s a playing field tilted deeply to corporate advantage. In 1997, World Bank officials made the privatization of Cochabamba’s public water system a condition of loans the bank was issuing to expand water service in the country. 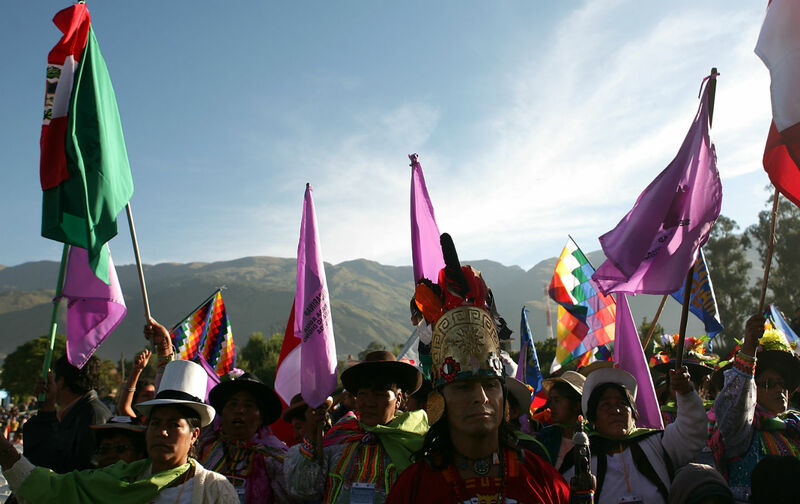 So Bolivia’s government was compelled to offer a 40-year lease to Bechtel, complete with a guaranteed annual profit of 16 percent—a gouging deal backed by the willingness of the government to shoot its own people if required. We hung that story not just around Bechtel’s corporate neck, but the neck of its CEO and namesake, Riley Bechtel. We even released his personal e-mail address to thousands of people. As people reached out to us to get involved, we armed them with the hard evidence and some advice on strategy, encouraging them to take whatever action they were moved to take that could build pressure on the corporation. In San Francisco, activists shut down Bechtel’s headquarters by chaining themselves together in the lobby. A local coalition also got the San Francisco Board of Supervisors to pass a city resolution calling on Bechtel to drop its Bolivia case—just as the company was negotiating a major city contract. In January 2006, besieged Bechtel officials flew to Bolivia and signed a deal with the Bolivian government under which it dropped its World Bank case for two shiny 1 boliviano coins—the cost of a local bus fare. No other major corporation, before or since, has ever been forced to drop such a major trade case by a campaign of citizen pressure waged against it. In the end, Bechtel was defeated by something very simple: a story. It was a narrative about people fighting for their water, and of a corporation content to see them killed in order to squeeze the poor for profits it never earned. The mighty corporation could never escape the moral power of that story. We hit Bechtel with it using not just one tactic, but every tactic we could think of—from legal briefs to direct action. We didn’t waste time debating which approach was more worthy. And there’s no shortage of stories to tell. The tobacco giant Phillip Morris demands $2 billion from Uruguay for the sin of strengthening health warnings on cigarette packages. The people of El Salvador face a $300 million case from a Canadian-Australian mining company because Salvadorans were able to block toxic mining operations. Germany faces a demand of €700 million from a nuclear energy company because, in the aftermath of the Fukushima disaster, popular movements won a moratorium on new nuclear power plants in the country. “It is impossible to overstate the impact of the people’s victory in Cochabamba against Bechtel,” Naomi Klein observed recently. “At a time when winning real victories seemed like a distant dream, we suddenly saw that it was still possible to win, even against a giant U.S. multinational.” In the battle of the Bolivian people against Bechtel, David beat Goliath not only once, but twice. In the midst of the current battles on trade, the spirit of both those victories and their concrete lessons well deserve our remembrance. Jim ShultzTwitterJim Shultz is executive director of the Democracy Center in Cochabamba, Bolivia. He is the author, most recently, of The Democracy Owners’ Manual (Rutgers).